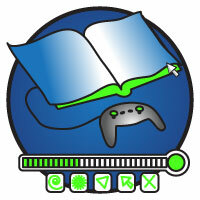 Games Based Learning Badge is the foundational badge in the Games Based Learning collection. The Games Based Learning Badge is awarded to those that have mastered the foundational principles and theories of games based learning provided by the Games Based Learning MOOC. •	Participated in online discussions, and media sharing in the Games Based Learning MOOC. •	Researched, shared and disseminated material on games based learning to the larger educational community. •	Demonstrated knowledge of games based learning at the Creation level of the Social Knowledge Network Construction Model. •	Created an immersive or games based learning proposal or project. •	Created an e-portfolio that curates their work done for the Game Based Learning badge. What do I have to do to earn this badge (or badges within this collection)? •	Introduction in what "What is Your Name - What is Your Quest" forum during the first week of the MOOC. learning video in the original post that is also put up in Games MOOC III diigo group. •	Reply (50 – 100 words) in weekly Games Based Learning MOOC discussion forums. •	Create at least a 4 page games based learning project/lesson plan by May 1, 2013.